Carotid arteries are a pair of large blood vessels that supply the head and neck with oxygenated blood. 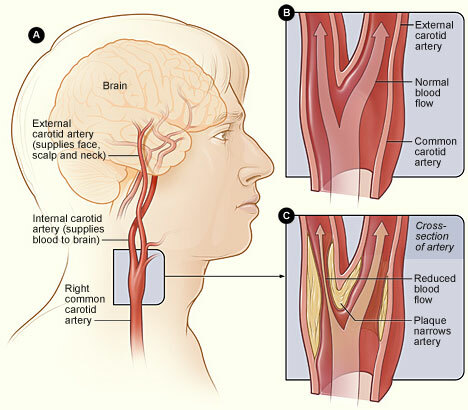 Carotid artery disease, also known as carotid artery stenosis, is a disease in which the inside space (lumen) of the carotid artery tubular structure is constricted, narrowed or even blocked, usually as a result of atherosclerosis or arteriosclerotic vascular disease. Atherosclerotic plaques (atherosclerotic lesions) are fatty, waxy deposits which form on the inner wall of a blood vessel from various substances transported through the bloodstream, including cholesterol, fat, proteins, inflammatory cells, cell debris, and calcium. The buildup of such plaques in one or both carotid arteries brings about impaired supply of oxygen and nutrient-rich blood to the areas of the brain responsible for thought processes, speech, maintaining personality traits, sensory and motor functions. The dangerous part is that such a buildup develops slowly and is hardly ever noticed by the affected person. Both TIA and stroke are serious medical emergencies and should be dealt with immediately. Factors that impose stress to the arteries and increase the risk of injury, buildup of atherosclerotic plaques and in general are linked to the development of atherosclerosis increase the risk of carotid artery disease. They include a family history of atherosclerosis or coronary artery disease, high blood pressure (hypertension), obesity accompanied by sedentary lifestyle, diabetes, abnormal blood-fat levels, smoking, physical inactivity and age. First of all, regular medical examinations and a thoroughly medical history that records risk factors and any signs or symptoms related to this condition may facilitate the early detection of the disease. While examining carotid arteries with a stethoscope, doctor may detect a bruit resulting from altered blood flow in the artery. To find out more, your doctor may request certain tests which allow assessing the blood flow and pressure, as well as possible narrowing of the blood vessel. Carotid duplex ultrasound is one of the common, noninvasive tests used to check for carotid artery disease. Carotid angiography is an invasive imaging procedure employing special contrast dye injected with a catheter that is been threaded directly into carotid arteries. The technique allows obtaining and analyzing the detailed X-ray images. Computerized tomography angiography (CTA) is an imaging test that uses advanced computerized tomography (CT) technology, along with intravenous contrast dye, to obtain high-resolution, 3D images of the carotid arteries. Magnetic resonance angiogram (MRA) is a specialized type of magnetic resonance tomography (MRT) or magnetic resonance imaging (MRI) scan that uses a magnetic field and radio waves to provide images of the carotid arteries. In many instances, MRA procedure can provide information that cannot be obtained from an X-ray, ultrasound, or computed tomography (CT) scan. This imaging test can provide important information about the condition of carotid and vertebral arteries and the degree of the stenosis. The main goal in treating the carotid artery disease is the prevention of stroke. Overall, the treatment includes lifestyle modifications and management of chronic conditions such as hypertension and high levels of lipids in the blood with the help of prescribed medications and medical procedures. Life style change include getting the appropriate level of physical activity, reducing the stress level, losing weight, quitting smoking, eating healthy foods and reducing the amount of consumed salt. Managing of chronic conditions implies controlling the blood pressure and maintaining the healthy level of cholesterol and other lipids in the blood. Certain medications may also be used under the doctor’s supervision to control the chronic conditions and prevent the blood clots from forming. Daily aspirin or some other blood-thinning agents may be prescribed. Doctor may recommend taking certain medications to control blood pressure, such as angiotensin-converting enzyme (ACE) inhibitors (Enalapril), Angiotensin II receptor antagonists (Losartan) or calcium channel blockers (Amlodipine), or/and a statin medication (Simvastatin) to lower the blood level of cholesterol. Carotid endarterectomy is surgical procedure and the most common treatment for severe cases of carotid artery disease. The plaque is removed through an incision and then repaired with either stitches or a graft. Carotid angioplasty and stenting is applicable for some patients when carotid endarterectomy is contraindicated. During this procedure a tiny balloon is delivered by catheter to the site where carotid artery is severely narrowed or blocked. The balloon is inflated to widen the artery, and a stent (a small wire mesh cylinder) is implanted to keep the artery from narrowing and blocking again. 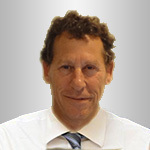 Like with most other surgical techniques, the knowledge and experience of the surgeon is a key factor in achieving the best possible outcome. The specialists of DRA Medical have lots of experience in performing the described surgical procedures. The follow-up care is important to monitor the progress of the treatment and prevent any possible complications.